The Meeting of the Lord. This event, in which Saints Simeon and Anna met in the Temple the infant Christ presented by the Mother of God and Joseph and glorified Him, is called the Feast of the Meeting of the Lord (Сретение Господа Нашего Иисуса Христа) and is celebrated in the Holy Orthodox Church as one of the great feast days on the 2nd of February (February 15th NS). 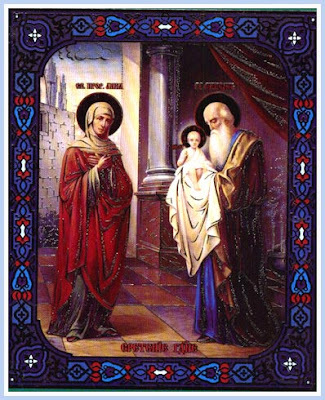 The righteous Simeon is called the God-receiver, that is, he who received in his hands God the Saviour.